As your nonprofit state association, we are here to provide resources to strengthen your organization. An in-depth look at Foraker’s sustainability model and how you can use the concept in your organization. A report highlighting the findings of our 2018 research on compensation in Alaska’s nonprofit sector. This guide will help with your fundraising program. The Association of Fundraising Professionals believes that ethical behavior fosters the development and growth of fundraising professionals. Review the AFP standards in this document. This document from the four leading professional organizations in the fundraising arena is a "must read" for all development officers and staff. This report from nationally known experts Jeanne Bell and Kim Klein outlines strategies being used by successful organizations in their individual donor fundraising. This report by Jeanne Bell and Marla Cornelius takes a hard look at why organizations have a difficult time hanging on to their fund development staff and offers suggestions on how to change that trend. Outline of Foraker's project protocols for working with Alaska tribes. 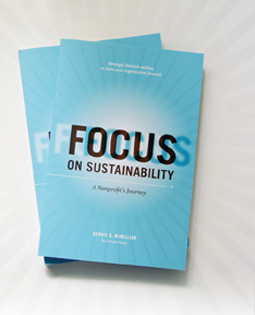 We believe sustainability is an organization’s journey, not its destination. For many, this is a different way of thinking about the term. Our model captures our thinking and can help your organization make strategic decisions about sustainability. 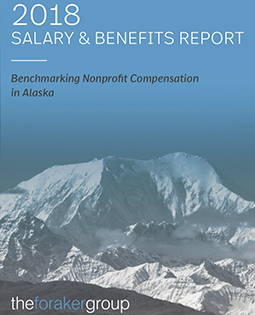 This report highlights the findings of our 2018 research on compensation in Alaska’s nonprofit sector. Refer to this example to help develop an appropriate anti-harassment policy for your organization. Do you have a system for keeping track of important organizational documents? Refer to this example to help develop an appropriate document retention policy for your organization. This short survey can help you better understand the recognition that employees in your organization would appreciate receiving. A review of the 2017 Tax Cuts and Jobs Act and its impact on nonprofits by the National Council of Nonprofits. Confused about what you can and cannot do related to elections? This guide will answer your questions. A summary of findings from a survey conducted on corporate giving programs and foundations in Alaska. 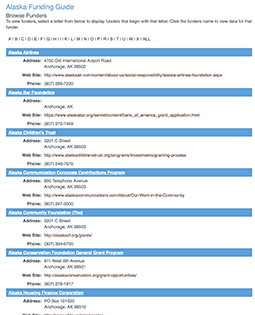 Reports Alaska-specific data on accomplishments, challenges, and capacity needs. Report goals: validate sector’s economic impact, activate the sector, monitor trends. Report goals: show sector as part of solution to state’s economic challenges and how it partners with government to deliver services. Summarizes full report with "call to action" for nonprofit leaders. Summarized full report with "call to action" for policy makers. An assessment of how the sustainability model is helping Alaska Native tribes exercise tribal governance. Reports on the progress stakeholders in our five-state region have made in creating a resilient nonprofit sector. As a starting point to increase the data and knowledge of the gender pay gap, this 2018 report focuses on the top-level employees in the Alaska nonprofit workplace. Report on barriers to people of color who aspire to leadership roles in the sector.